Kendata Peripherals, a leading provider of data-entry products and services, has significantly enhanced its forms-processing bureau service through the use of an in-house developed software package and by investing in additional hardware at its Southampton-based facility. The company's bureau-service clients are typically organisations using short questionnaires to obtain feedback from customers or staff. 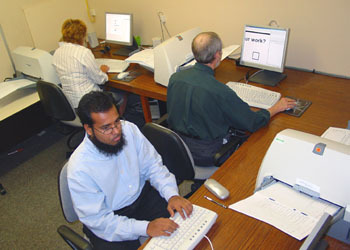 These questionnaires normally include a combination of check-mark boxes, bar codes and free text boxes, and when complete they are returned to the Kendata bureau for scanning and processing. of forms in a short period of time, and the company's new forms-processing software further improves service levels because it specifically addresses the needs of the bureau environment. Developed by Kendata after years of using commercially available products, the new software minimises the need for operator intervention and handles all the decision making when errors such as double marking are detected. As each sheet is scanned, a unique identification number is printed on it to provide a complete audit trail, which is especially important when dealing with longer survey booklets as they have to be separated into individual sheets prior to scanning. In addition, the software randomly selects a certain number of forms for QA validation from each batch, thereby ensuring that quality assurance checks are carried out in accordance with the sampling requirements of ISO2859/BS6001. After each batch has been scanned, the software prints out two copies of a batch label, identifying the documents selected for QA and listing any forms in which errors were detected. To complement the new forms-processing software, Kendata has invested in additional equipment, including the Kodak i260 scanner - which features ultrasonic double-sheet detection - and the latest PC hardware, 17in. and 19in. TFT monitors and DVD writers. The company has also introduced an online response-monitoring facility that enables customers to use a secure area of the Kendata website to check how many completed questionnaires have been received each day.